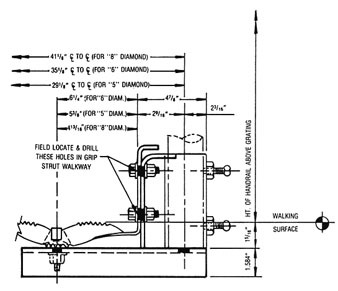 Eliminate unnecessary and costly substructure to support handrail post. Available in two styles: (1) Pipe Sleeve and (2) Clip Angle. Catalog No. example: HRB-P-5 where P designates Pipe Sleeve and 5 designates 5-Diamond. Substitute ‘P’ for Pipe Sleeve or ‘A’ for Clip Angle. Substitute Diamond Number in Last Position. Handrail brackets are sold in plain non-finished steel but may be ordered in a hot dipped galvanized after fabrication finish. 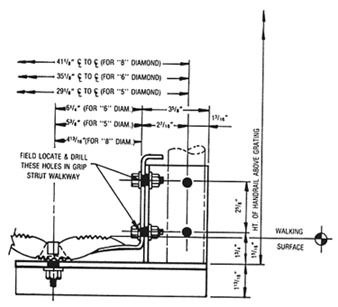 All hardware for mounting Handrail Bracket to Heavy Duty Steel Walkway is included. Catalog No. 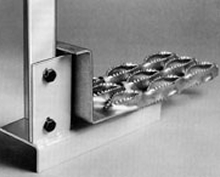 HRB-P-_ Designed for use with pipe style handrail post (Max. 2” O.D.) which allows for simple installation of handrail post. Secure post by tightening two allen head set screws. Catalog No. 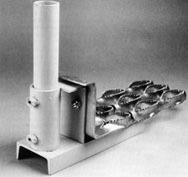 HRB- A-_ Designed for use with all types of Handrail Post: Pipe, Angle, Tube, etc. Handrail Post may be mounted to Handrail Bracket with two 1/2” bolts and nuts (not included) to holes conveniently located, or by welding.